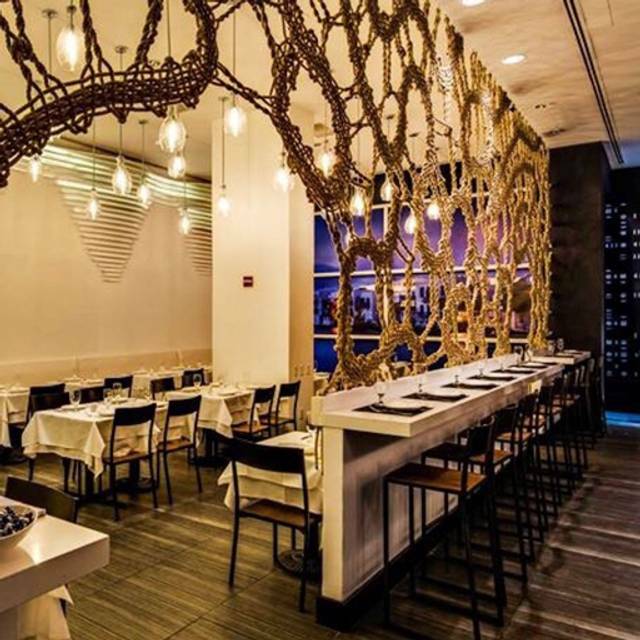 The Mykonos Blue Rooftop & Lounge thus serves as the perfect location for corporate or holiday parties, product launches, cocktail or fashion events, dinner parties, birthdays, rehearsal dinners, engagement parties, bridal showers and more. Housed inside Hotel Hayden is Mykonos Blue part of the Ethos Restaurant Empire, Kyma, Ethos, Pathos, BBG. Mykonos Blue Embody's the ambiance of the greek islands from the food to the restaurant's design, providing an ethnic dining experience that will stir memories of past vacations to Greece..Enjoying unique bold tastes and flavors of our Authentic Greek Food will excite your taste buds, as we bring you the finest imported cheese, wines, and oils from the back yards of Greece right to your palate. 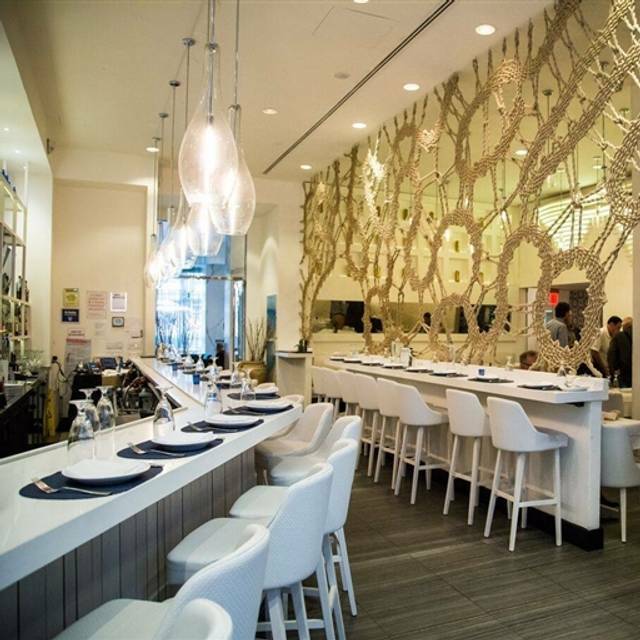 It was a beautiful location with delicious food that is reasonably priced. The wait staff was great and attentive to my food allergies, which I greatly appreciated. I will definitely recommend this to my friends! Casual restaurant, Nice view though the windows could be cleaned. Weight service was not great that the buyer of the wines was fantastic, and very knowledgeable. Good comfort Greek food. Everything was very good but we were a little disappointed. We had a Pulsd certificated and the value was excellent but we felt that the portions were reduced due to the use of the certificate. My favorite Greek spot in the city! 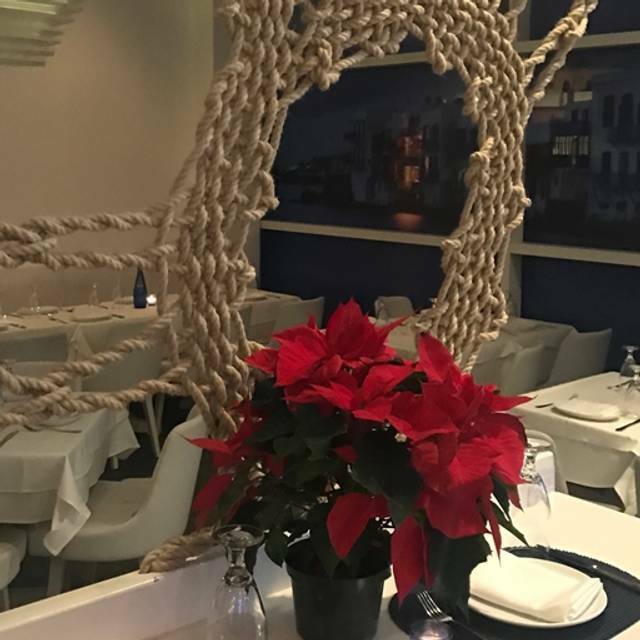 Everything from the authentic and seriously delicious Greek cuisine, to the ambience and hospitable staff makes this restaurant unique and the perfect choice for someone that wants to enjoy all of the above in one. The octopus and the Greek salad are staples in my order and usually I'll accompany that with the catch of the day. I appreciate that I can always count on the server to be honest about the quality and freshness of the fish, that has me coming back. Shoutout to Gigi as well who's always friendly and accommodating with the seating even when the place is packed for an event! Great job guys and I'll see you again soon! Our server Wilfred was awesome! The food is always delicious at this place. This is our new best spot! Service was incredibly slow for a not busy night. The roof area looks nothing like the website. Took 45 minutes just to get wine. This was not a good experience and was expensive. Felt more like a tourist trap. We absolutely loved it! Food is so fresh and delicious. Try the fish there totally recommend it! Our server was very friendly and attentive and had a great knowledge on wine! The cocktails at the bar were delicious as well. But what cant be beat is the view, this place has an amazing view and ambiance along with very reasonable prices. ABSOLUTELY A HIDDEN GEM! A party of 9, Demetria came over and made us all at ease when he took control of our menu choices. He asked one question “any allergies” answer was NONE, and he took care of the rest! Great meal had by all. 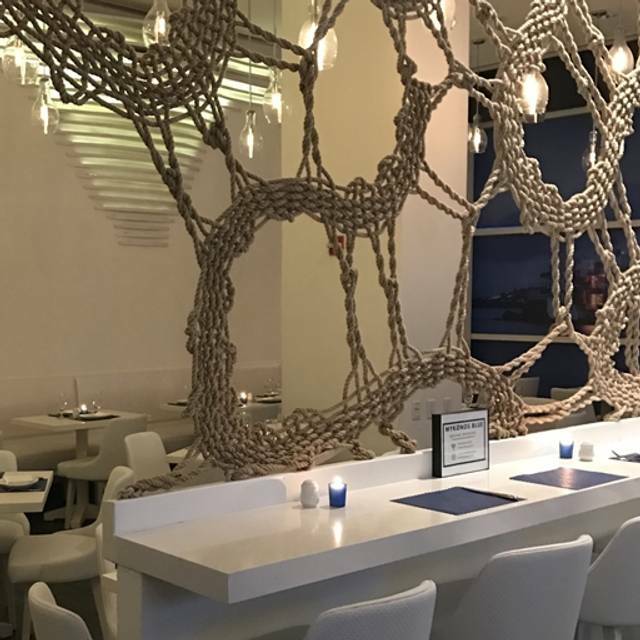 My husband and I had a most enjoyable dining experience at Mykonos Blue. We sat in the "outdoor"rooftop dining room on a cool, windy March evening. The heaters made it very comfortable, and we felt as if it was summer evening, with the NYC skyline all around. Our waiters were attentive and helpful. We had the Octapodi Sharas (grilled octopus) for an appetizer, and we had Lavraki ("Bronzini” Fish) for our entrees. All delicious. We were surprised by a complimentary dessert sampler the meal. It was the perfect ending for a great evening. Nice find near Penn Station. The food was good quality and authentic Greek. Charming interior. Terrific food and drinks. Place smelled a little musty. But service was impeccable. Very nice and quiet restaurant on top of hotel, nice views of the city. Food was excellent as was the suggested Greek wine. I will definitely go back next time I'm in NYC. Hey are going through construction on their 1st floor so we were in the roof which was great. Food was very good. Great waiter! Demetri was the best! A very pleasant evening. While the menu is limited, everything we had was very tasty! The service was excellent despite the fact that the food was delivered via elevator. The restaurant is in a temporary location and they are trying their best to make it all work! Efkaristo para poli! We met some friends and were graciously welcomed and shown to a table with a gorgeous city view. Today Mykonos Blue was serving on the rooftop. Food was authentic and reasonable - Service was outstanding. We enjoyed a bottle of Asyrtiko and watched day turn into evening! I would highly recommend MB. Now that I have eaten both in the main restaurant (ground floor) and rooftop, I can tell you both are excellent - the roof offers a little something extra! The food was excellent and cooked to perfection. We started with the Pikilia spreads small plate and then had the Kotopoulo chicken entree. For dessert, I had their delicious Baklava. We also enjoyed the nice rooftop dining space. The menu was bit overpriced, but nice experience overall. Loved the ambience and the food. Service was a bit slow, but probably only because we had to get out for a performance and we may not have emphasized that to the waiter. 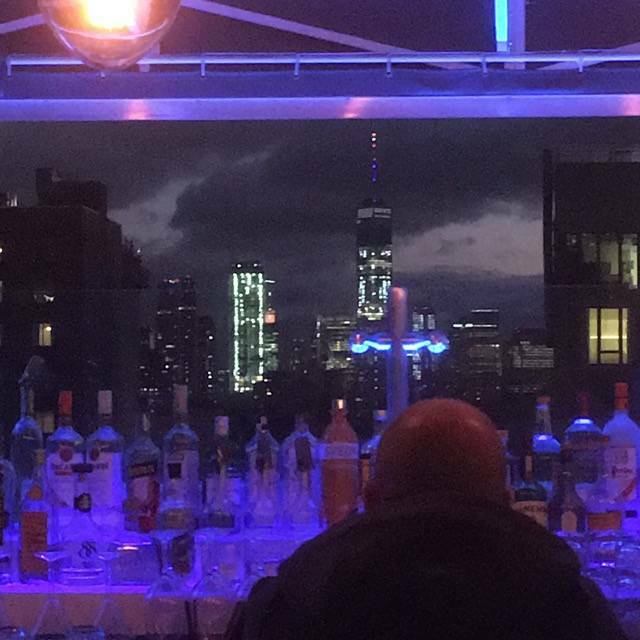 Loved the temporary upstairs location with great city viewd. Great views. Great place to grab a drink or plate to eat. I cannot comment about the menu or the physical aspects of the place. I understood they had some water or other issues, but confirmed my reservation for a suitable table for 8 on Tuesday at 6:30pm 02.26.19 - I called an hour before (on) that day ti make an inquiry and was told they were "CLOSED." No phone call, No email, No text, No apology, No contingency offered, Nothing was offered - NOTHING! It was a very, very special birthday celebration; they almost ruined what should have been a joy filled night. We were celebrating a wedding engagement and shopping for wedding dresses. Our waiter was exceptional! The restaurant was empty when we arrived for lunch. Ordered an iced tea and had to ask for it again 20 minutes later. Food was served 40 minutes after order was placed and the salmon with rice pilaf was covered in oil - my husband could have made it better. 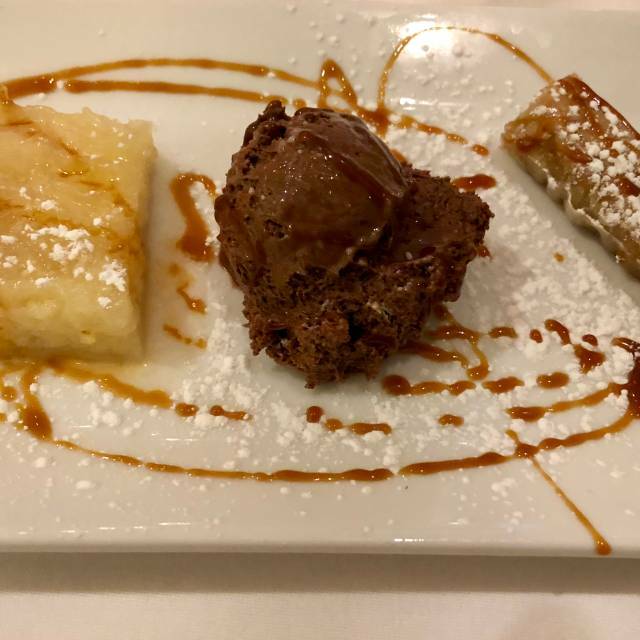 They were nice to offer complimentary dessert but the baklava was soggy and chewy. The branzino was one of the best I ever had, including high end restaurants, service excellent.....and very importantly, not loud....(maybe I was lucky). It’s a bit too pricey for what you get. The waiter and the bartender kept changing the volume of the music which was weird. The waiter also hovered so closely it was awkward. Just a weird, far from relaxing experience. For $200 we expected better. The food was ok but not fabulous. 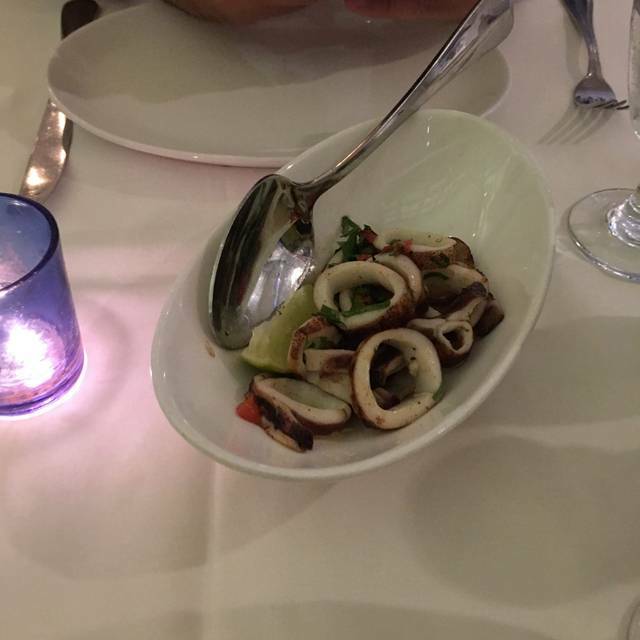 Server was not professional, fish had bones in it. Overall we had a lovely experience here. We have been to Greece before on our honeymoon and thought this was an authentic find for NYC, particularly in Midtown. My husband and I came here for Valentine’s Day. Although when we originally sat down there was no waiter to be found, we pulled over one of the owners and he was completely attentive and pleasant for the rest of the night, he made great recommendations for wine pairings and overall we had a great meal. We thought the food was delicious. We would love to come back! Took my wife here for Valentine's Day. I expected a roof top restaurant but it was a ground level restaurant with a bar on the rooftop area. This was still nice but not what I expected. There weren't too many vegetarian/vegan options. The food was just ok. The lamb chops were very good. Everything else was not on every course of the meal. I wouldn't go back to this place. The waiters were very sweet. The food was great. Sometimes the music was a little oddly picked but overall it was a great experience. Our waiter was a stage actor and attended to us with the expected flare. The food was good but the service was a bit bizarre, as our waiter really wanted to steer us towards certain items (and managed to do so with 3/4 of our party) — plus the service was inattentive (once I didn't take waiter's suggestion). The next day we returned to have a drink at the rooftop bar area - with different servers - and found this waiter also wanting to steer us towards a certain item. (For example, we asked specifically for one item, and were told that he would instead make up a plate with a lot of different items.) The location is convenient but I can't say I would return. Our waiter recommended the best Pinot, and every dish they brought to the table was fantastic. The horiatiki was authentic, and the branzino delicious. Highly recommend. The food, wine and service was excellent. the ambiance is lacking. walking through the hotel is a bit of a drawback. Other wise, I will return for the food. Located in a hotel lobby, there was no host when we walked in but I think it was the chef that seated us. The manager later on gave some food suggestion and the waiter offered drink specials. We had a quick dinner with our 8 month old son, the restaurant was accommodating to our needs. Service was sufficient. Food was okay but not memorable except for the chocolate mouse that is accompaniment to our dessert. That was outstanding. This was my first visit, and oh yes! The food is wonderful. The small appetizer plates were just great. We had meatballs, octopus, a delicate and superbly prepared shrimp appetizer, and a really great moussaka main dish. The service was warm, attentive, competent, and the bartender mixed up a great old fashioned. There are some excellent Greek wines, and we will definitely go back soon. 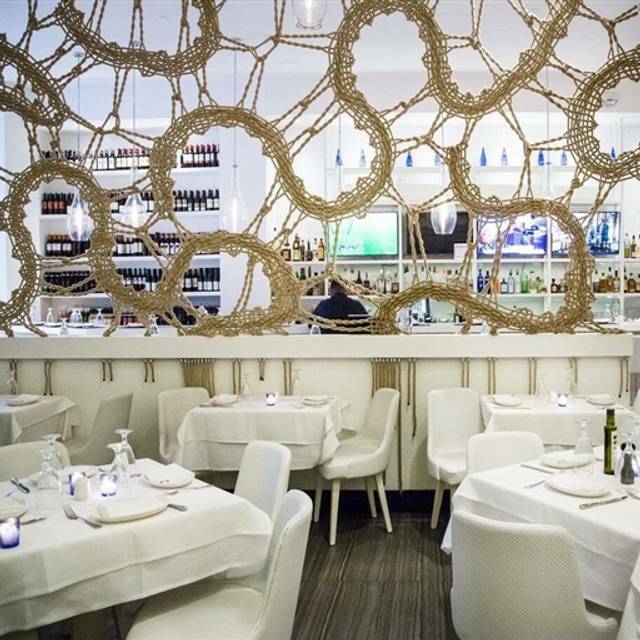 The design and ambiance clearly evoke Mykonos. How nice when it's really dark and cold outside. We also got live music as an added treat. Very lively spot ( noisy between guests & music). Food was very good: spreads plate had good variety. Spanakopita portion a bit small. Lamb shank was yummy, and salmon also good. Pulsd deal was a fantastic value, and our server (Kosta ?) took really good care of us! 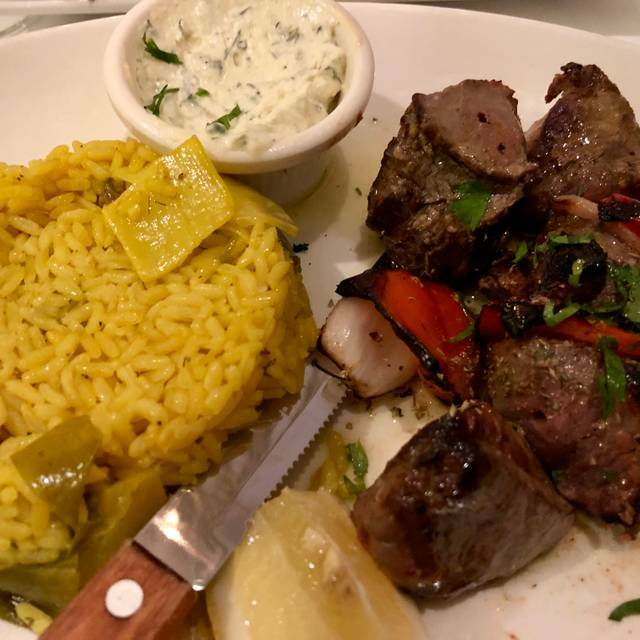 Coming from Queens, there's a number of great Greek restaurants so it has to take a lot for me to venture into Manhattan for some Greek cuisine. The ambiance is amazing and the noise level is very good for conversation. I thought he food was very solid, especially the eggplant appetizer. The prices are normal for Manhattan (not overpriced but not a value deal). The service was very good except one of the servers was a bit rude towards the end of the evening when I used an Open Table coupon for my bill. If I'm in the area, I would go back but I'm not sure I would go out of my way to come from Queens just to go back since there are a number of comparable places here.